When you acquire images in Photoshop Elements from media sources, such as CD-ROMs, DVDs, external hard drives, and your internal hard drive, the process is very similar to opening files from digital cameras. Insert a CD or DVD into the CD/DVD drive, and the Windows AutoPlay Wizard opens just like when you insert a media cartridge or connect a cable from your camera to your computer. Open the Organizer from the Welcome screen. When the Organizer window opens, choose File→Get Photos and Videos→From Files and Folders. Open the source drive from the listed drives. You see the photos stored on the media. 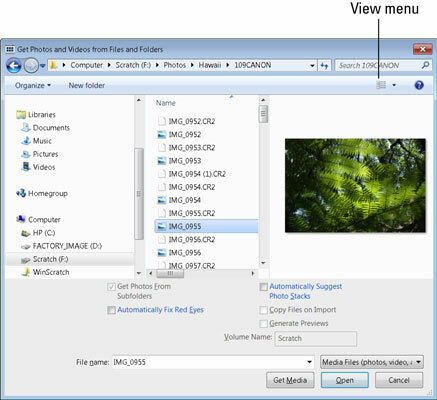 Select images and click Get Media (from the Organizer) or Open (from one of the editing modes) to open the files in the Organizer or an editor. Now, you can edit the photos in Elements or save them to your hard drive. The Get Photos and Videos from Files and Folders dialog box. If you insert a media device and your photos are automatically loaded up in iPhoto on the Mac, you can easily import the iPhoto images into the Organizer. Unique to the Macintosh is the File→Get Photos and Videos→From iPhoto command. A dialog box opens where you can choose to import photos as iPhoto Events or convert imported photos to Albums. You can convert Events or just simply import photos from your iPhoto library. All photos contained within iPhoto are imported into the Organizer.